I have been dying for some sweet, salty, chewy, and very chocolatey cookies lately, but have frankly been too lazy, and too busy (bad combo) to do anything about it. One of my favorite bloggers, Sweet Pea's Kitchen, happen to post a recipe for Thick and Chewy Chocolate Chip Cookie Bars. It was exactly what I was looking for. All the yummy of cookies, without slaving over an oven repeatedly putting in and taking out sheets of cookies. It mixes up quick, didn't even need a mixer, just a whisk (BIG bonus!!) and bakes up in no time. 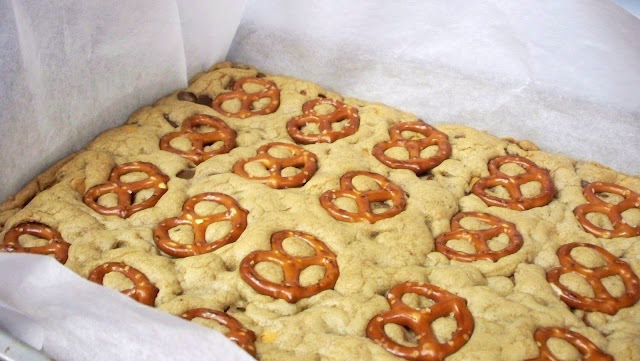 The only modification I made was that instead of all chocolate chips, I added chocolate chips, butterscotch chips, and then pretzel pieces, and then some whole pretzels on top just for presentation points. They truly are heavenly. Sweet, salty, chocolaty, crunchy, chewy, seriously, just heavenly. Pre-heat oven to 325 degrees F. Line a 9x13 inch baking pan with parchment paper, with ends extending up the sides (will be for easy removal later). In a medium bowl whisk together flour, salt, and baking soda and set aside. In a large bowl, mix together with a whisk, the melted butter, brown sugar and white sugar until combined. Add egg, egg yolk, and vanilla and mix well. Using a spoon or spatula, mix in dry ingredients into the egg and butter mixture until just combined. Mix in the chocolate chips, butterscotch chips, and broken pretzel pieces and mix well. Scoop into the prepared pan, using a spatula to press it down evenly into the pan. Place the whole pretzels on top in a decorative pattern (I used 24 evenly spaced ones, so when they are cut, there would be 24 servings, each with a pretzel on top) and press down slightly. Bake for 27-32 minutes, until the top is light brown, slightly firm to the touch and the edges start to pull away from the sides. Remove from oven and let cool on a wire rack to room temperature. Using the parchment paper, lift the bars out, cut into 2-inch squares and serve. These sound heavenly! Love the sweet and salty combo! Holy cow, I see why these are called Heavenly! Thanks so much for sharing at MTM Mondays! Hey Lindsay! These are featured on this week's KCS link party!!! Thank you for sharing. Thank you so much for the feature, that is awesome!!! !